While 2017 is taking up the speed with events all over the world, we want to take one look back on publishers’ performance in France in 2016 – just as we did for the UK, the US and Germany. For this analysis we will first take a look at the field of general Google News visibility. Afterwards we will move on to the Google News Boxes for the desktop SERP. For the third tier we will look at the AMP Carousels as an important element of the mobile SERP in 2016. For the grande finale we will present you with the top 50 Google News topics in France for 2016. Leparisien.fr‘s visibility dramatically decreases from May onwards. 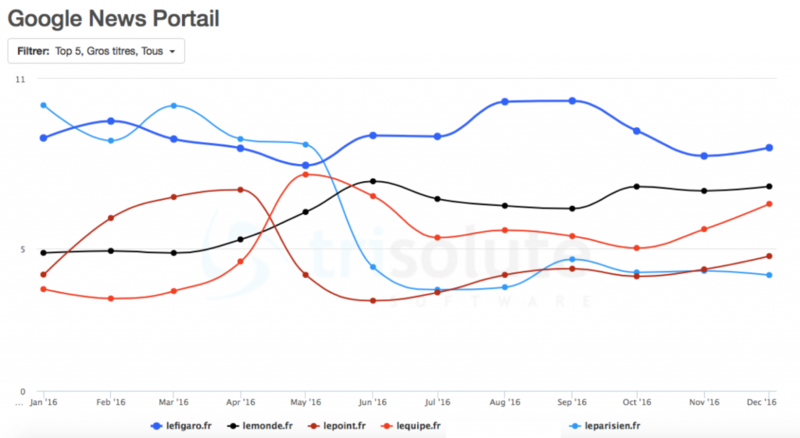 As the visibility in Google News 2016 is concerned lefigaro.fr is the overall strongest player over the whole year. They begin strong with 8.91 percent visibility in January and get up to 10.22 percent in September. They lose only 0.34 percent visibility overall and finish with 8.57 in December. Lemonde.fr, our runner-up, only starts on third position with a minimum of 4.86 percent visibility in January. But they get strong over the summer with a maximum of 7.38 percent in June and stay strong until the end of the year, where they finish as the second best. 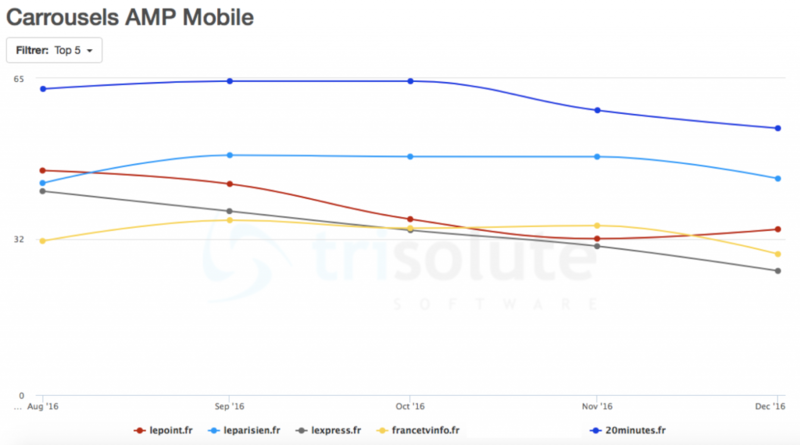 While leparisien.fr starts the year off with its best visibility of 10.06 percent in January, its visibility falls under the 5 percent mark in June – with a different of over 4 percent to May’s score. They can not regain their place in the upper ranks of the top 5 and finish with 4.08 percent in December on fifth position and less than half of amount of indexed headlines in Google News compared to the beginning of the year. Lequipe.fr starts only on fifth position in January and stays under 5 percent until April. But, it takes a huge leap in May with its best score of 7.62 percent and overtakes lepoint.fr and leparisien.fr for the rest of the year. After all, it finishes its year with an increase of about 3 percent visibility compared to January. For lepoint.fr we have a visibility curve that is the total opposite of lequipe.fr‘s curve. Contrary to them they gain visibility between January and April, where they reach their strongest point with 7.08 percent. But they then tumble down to 3.18 visibility in June and finish the year just barely in front of leparisien.fr with 4.75 percent in December. Lemonde.fr lose their winning streak at the end of the year. Nevertheless they are the clear winner of the visibility in the Google News Boxes for desktop. Lemonde.fr moves from second place in Google News to first place in the News Boxes. They manage to stay 11 months on top of the competition with a visibility constantly around strong 20 percent from January to October. But they deviate in November and stay under 18 percent for both November and December, where they reach their minimum of 17.09 percent. This is still a noticable visibility in international context. Second best lefigaro.fr stays 9 months in front of the newcomer 20minutes.fr. Their wobbly curve reaches a maximum of 20.028 percent in February. Here their best keyword with 1089 entries is “état islamique” compared to only 196 News Box appearances for lemonade.fr and 43 for 20minutes.fr and non for the rest of the top 5. But, in December they shrink to their minimum of 13.10 where their only second best competitor with their strongest keyword being “donald trump”. But as we see this keyword has an overall strong interest in 2016. On third place is 20minutes.fr. They have an equally rocky curve, especially in fall and winter. Their minimum of 13.83 is placed in July and their maximum of 18.49 is reached by November. Lequipe.fr starts and ends 2016 with low visibilities around 12 percent, but they reach their peak in summer with up to nearly 18 percent. Our last contender in the top 5 is leparisien.fr. They are off to good start with a maximum of 13.55 in January, however their visibility slightly decreases over the year and they end up with a minus of 2.01 percent visibility that means 11.54 percent as an ending score in December. Google has stated several times through 2016 the increasing relevance of the mobile SERP. In February 2016 they introduced the AMP carousel in the US and UK and some days later also in France. The relevance of the AMP carousels increases continuously and we started monitoring them in France in August 2016 – so that is where this analysis starts. By far the strongest player in the mobile AMP Carousels for 2016 is 20minutes.fr. Even though their weakest month is December with 54.73 percent visibility. They are always 10 or more percent above the competition from August until December with an impressive market share of over 50 percent. If you wonder about the relative high visibility numbers keep in mind that the normal AMP carousel has six up to ten positions. Leparisien.fr gets on an overall second place. Its worst month is August with 43.48 percent on third position. However, its best month follows with an upgrade of nearly 6 percent and a score 49.20 percent visibility and stays on second place for the remaining 3 months. However, August is the best month for lepoint.fr with 46.06 percent and they are on second place with 2.58 percent above leparisien.fr for this month. But their worst month on fourth position is November with only 32.06 visibility and 16.83 percent below leparisien.fr. On fourth position for the AMP carousels visibility we have the new steady francetvinfo.fr. With not even a 10 percent difference between their worst score of 28.9 in December and their best score of 35.85 percent in September. Lexpress.fr is our last competitor in the top 5. They uniformly decline form 41.81 percent in August to 25.45 percent visibility in December. It is a bit surprising that neither Le Monde or Le Figaro reach the top 5 for the AMP carousels’ visibility. Besides the AMP carousel we cover all news related elements of the mobile SERP (Publisher carousels, Twitter Carousels, Google Post/Google Podium, Live Blog carousels etc.). We will continue to present the data concerning all the elements of the mobile SERP. 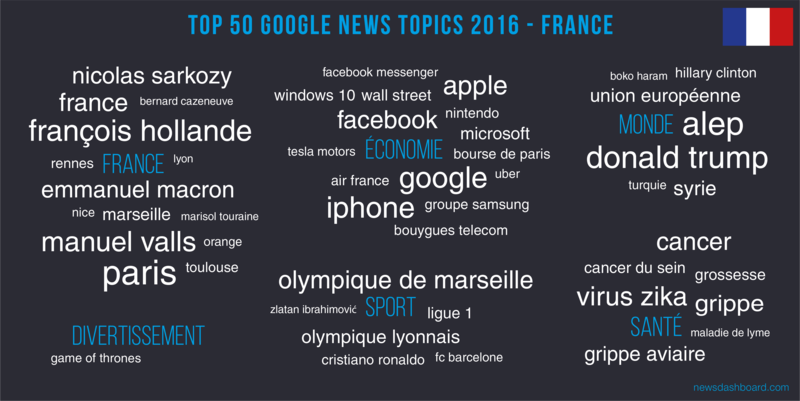 To round up the analysis for the year 2016 we want to show you the top 50 Google News topics of 2016 in France. We have looked at the Google News Topics that have been picked up most often by our hourly measurement from Google News with the News Dashboard throughout the year. This shows what topics and themes the people in France were most interested in throughout the year. We have grouped these keywords in our own different categories for clarity as you can see above. The top 5 keywords overall are: paris, donald trump, google, iphone and françois hollande. If you decide to read our other international reviews of 2016, you will see “donald trump” in every top 5 for Google News topics with slightly different positions. We have most of the top 50 keywords in the categories économie and France and the least amount in divertissement and sport. 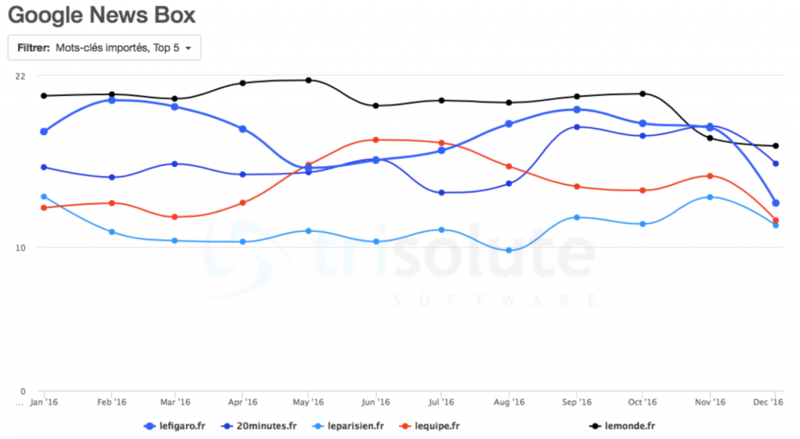 Lefigaro.fr is strong in desktop visibility, but has yet to appear in the top 5 of the up and coming AMP Carousels and in the same position is lemonde.fr. While lepoint.fr is not bad for Google News and AMP visibility, they could do much better in the desktop Google News Boxes. And lequipe.fr does well for Google News and desktop Google News Boxes, but could improve their mobile AMP visibility. Leparisien.fr is generally an overall good player, but they have yet to reach their full potential with their desktop visibility. Also they had a strong decline at the second half of 2016 concerning their Google News visibility. Although we do not notice 20minutes.fr in the top department of the Google News visibility, their AMP visibility is incredibly high and they are still good in the desktop Google News Boxes. Francetvinfo.fr and lexpress.fr are for 2016 only players in the top 5 for AMP Carousels.